Bali, the island of Gods – whenever this gem island of Indonesia is mentioned, many will immediately think of the famous party beach Kuta and the thrilling waves at Nusa Dua. 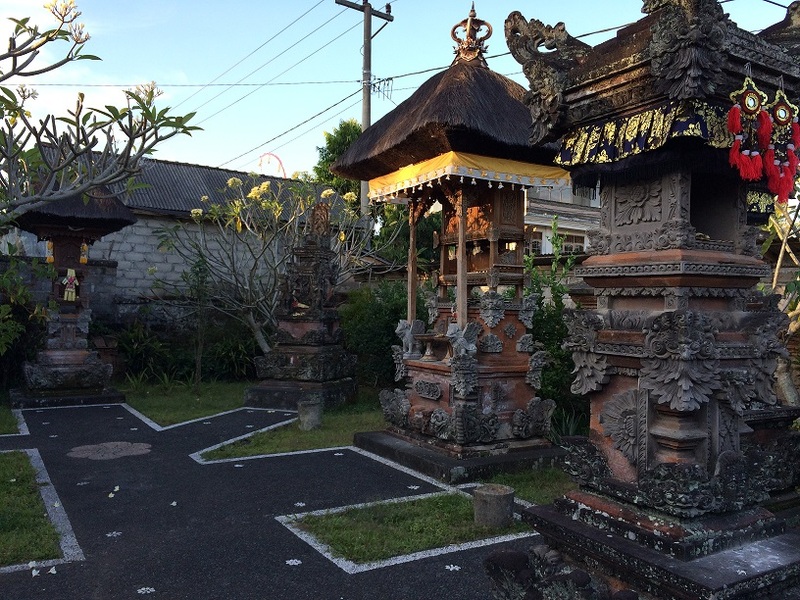 But if you are a fan of Eat, Pray, Love like me, you will know that there is another side of Bali that is synonymous with peace and tranquility. 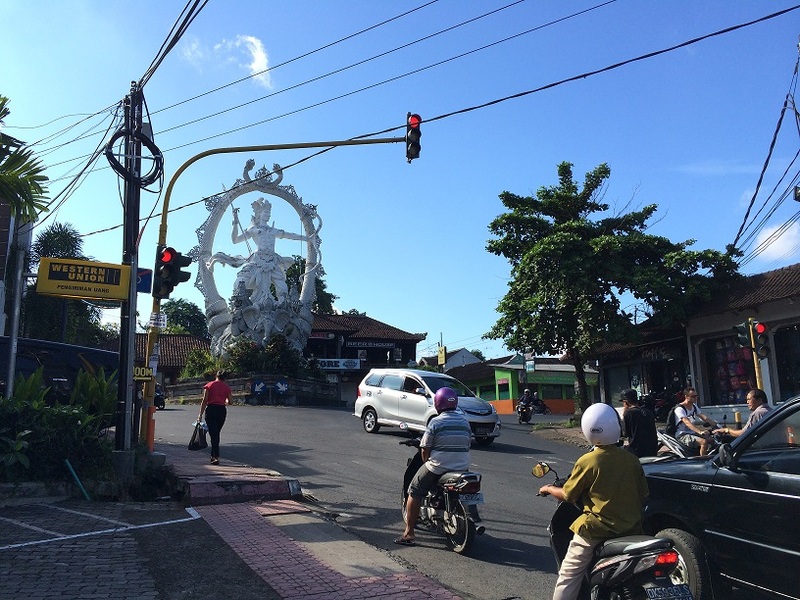 Welcome to Ubud. 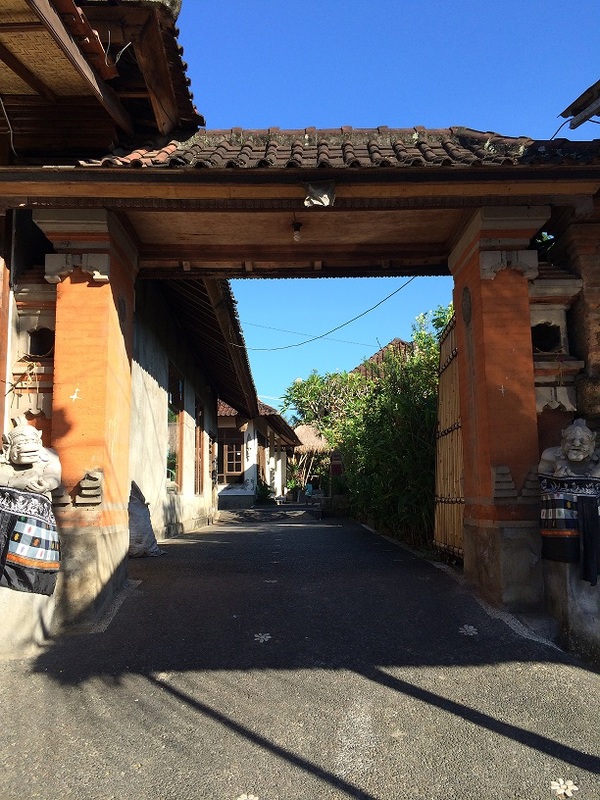 Also known as the ‘Soul of Bali’ by the locals, Ubud is located in the centre of Bali, about an hour to two (depending on traffic) drive from the ‎Ngurah Rai International Airport. Upon arrival, visitors might get overwhelmed with the numerous name plates that cluttered at the arrival gates, so if you have arranged for airport transfer with the hotel or home-stay, it will be good to have the necessary contacts with you on hand to locate your driver just in case you can’t find him in the crowd. There was a local festival going on when I was there, so these religious structures/poles were seen everywhere along the streets. The locals displayed the poles outside their homes and businesses. There are also plenty of taxis outside the airport, and many will try to tout from the moment you stepped out of the gates. To prevent the hassle of haggling with a local having just stepped out of the plane (which I’m sure most of us are too tired for it), your best bet will be to get a taxi from the taxi counter at the airport. The airport taxis are pre-paid but it’s generally safe and the rates are standard. For reference on taxi fares, check out this page here. 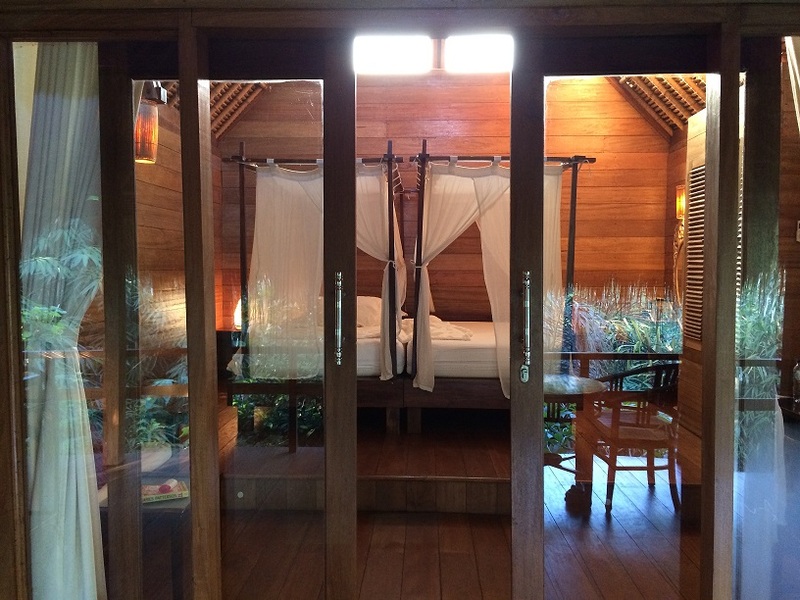 As I have arranged for a private airport transfer with my host, so the fare is slightly higher (250,000 rp), but I’m not complaining as the place I am staying is rather remote within Ubud, so it’s better to ride with someone who knows exactly where we are going. Besides, it allows me to talk to the host and get to know the neighborhood better. We also took a detour to grab lunch nearby (on his recommendation, we went to a nice local eatery) and he even brought me to a shop to get a prepaid SIM card for my phone. So I guess I’m paying extra for the convenience! Ever since I found out about Airbnb, I’ve always wanted to try it out. Why? For the experience of course! To me, the best way to explore a foreign city will be to stay with the locals and eat what they eat, because only then you can see the true spirit of the local cultures. 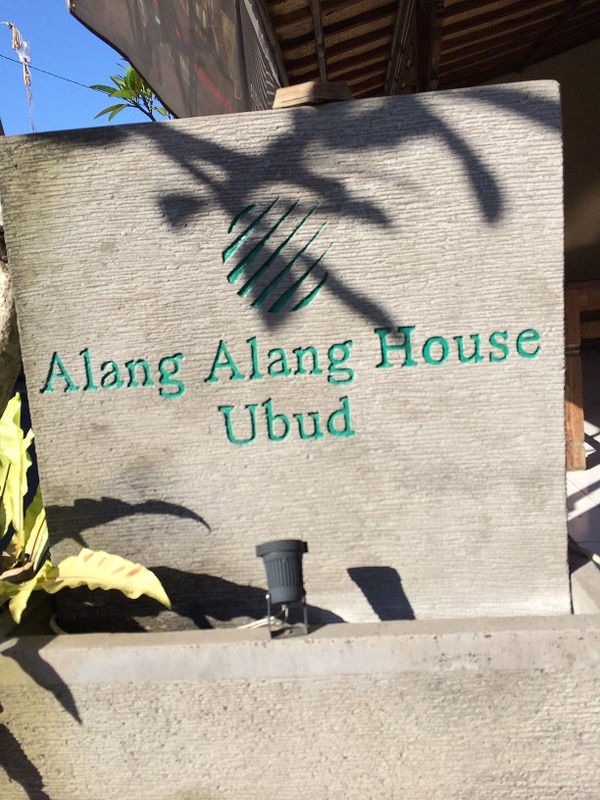 After doing a good amount of research, I decided to go with a home stay in the Gentong village of Ubud called the Alang Alang House. 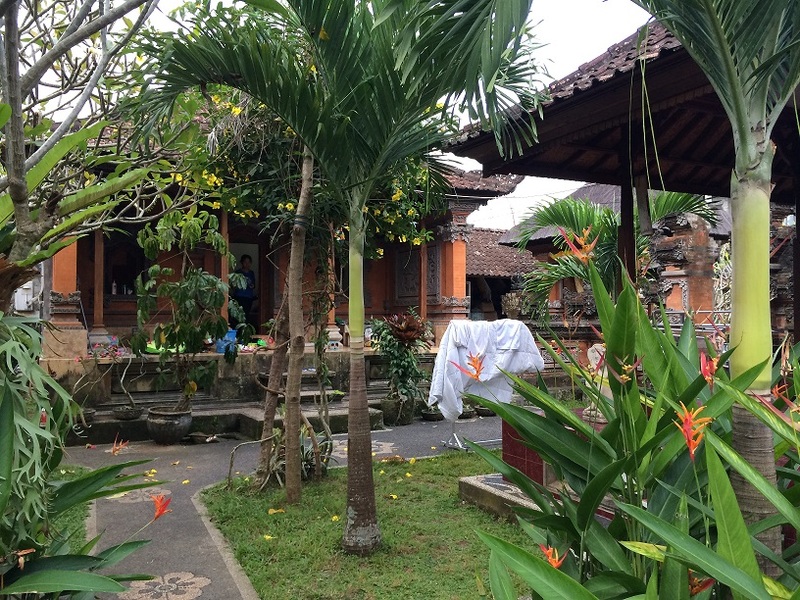 A traditional Balinese residence where cottages and stone buildings are contained within the compound, one can immediately feel the spirit of the Balinese culture here. Hand-craft stone arts, temple garden and straw cottages, the peacefulness delights me. 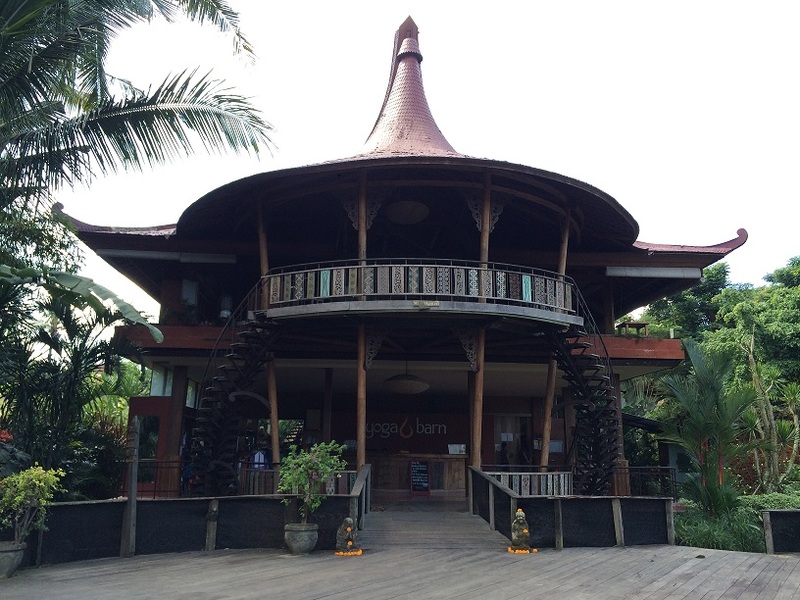 Host by the village head of Gentong, the Alang Alang House is situated along the arts and craft street where wood and stone craft shops can be found. 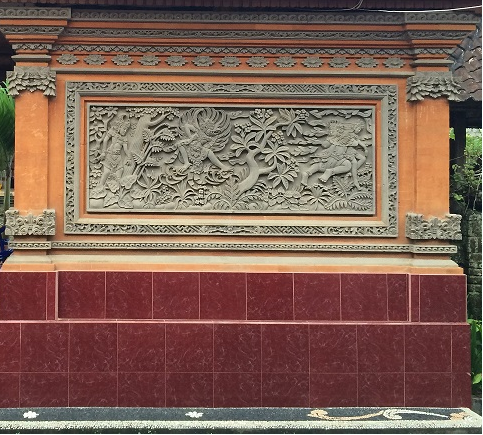 Stone carving on the wall. All handmade! 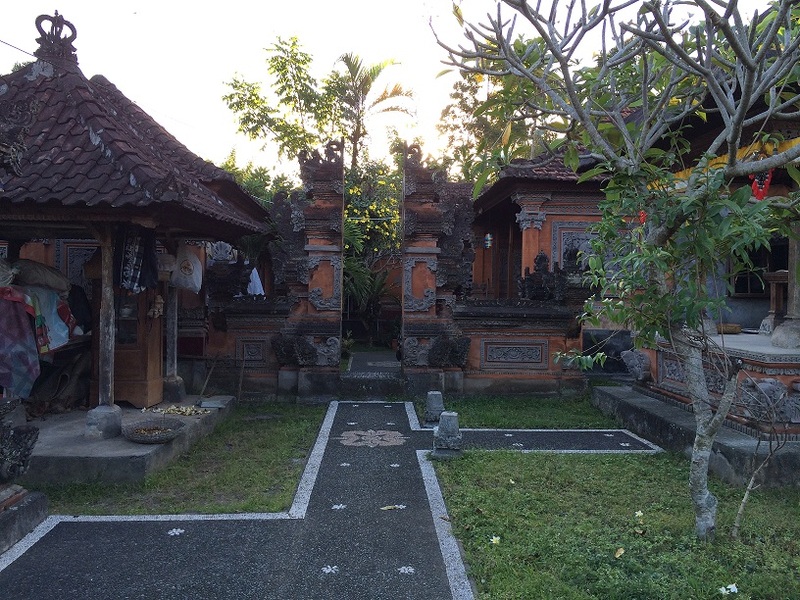 An area in the residence is set aside for the family temple to worship the Balinese gods. 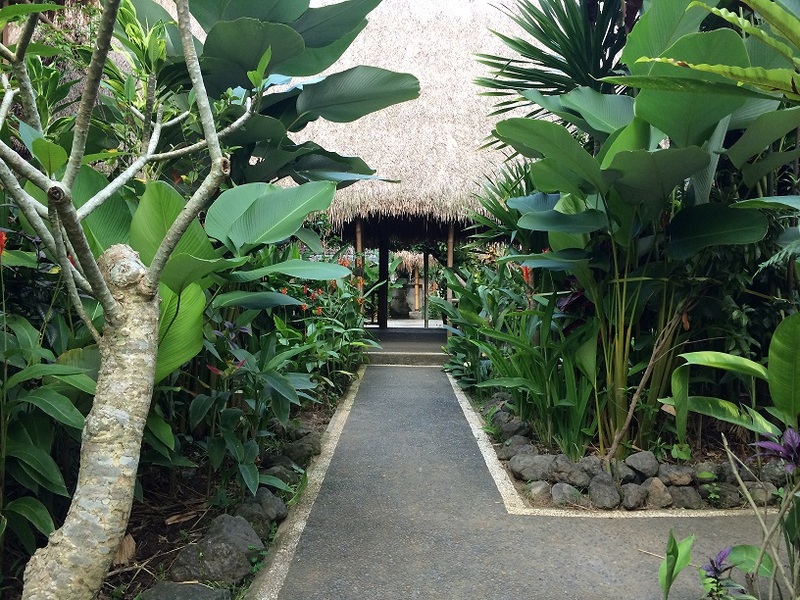 Staying here is like living in a garden. Passing by the greenery on my way to the room. When I finally saw my cottage house, I can’t help but to feel a little excited. 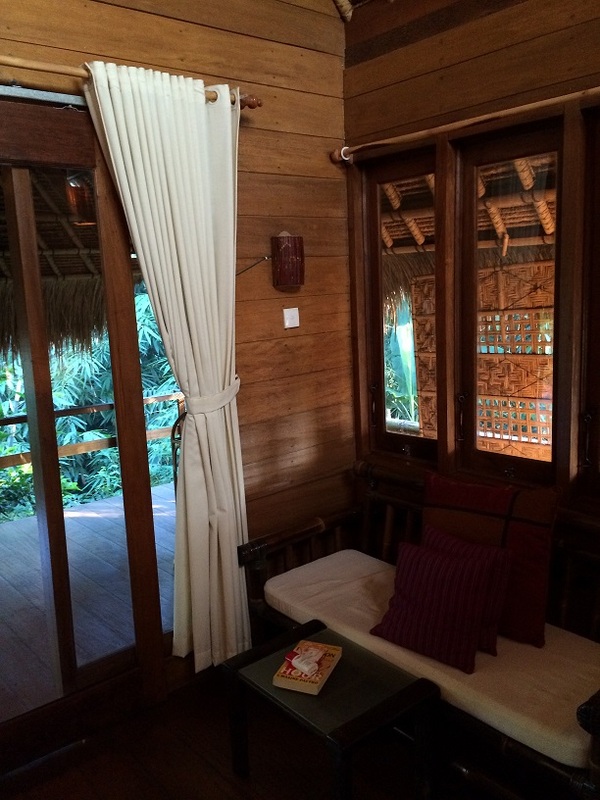 A wooden structure supported by stilts, the Alang Alang straw cottage is everything I imagine it to be and better. I was greeted by this lovely view when I arrived. Nice! Wake up in the morning to a greenery view. Yep, I am very satisfied with my room. Oh, did I also mentioned that they have room service too? They can even arrange for in-room massages for you at pretty good rates. 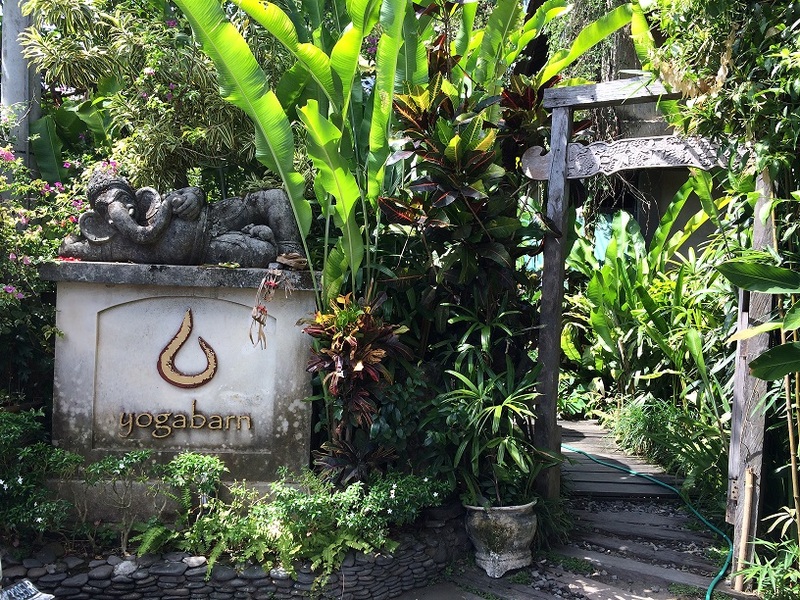 One of my key objectives during this relaxation trip is to do yoga. 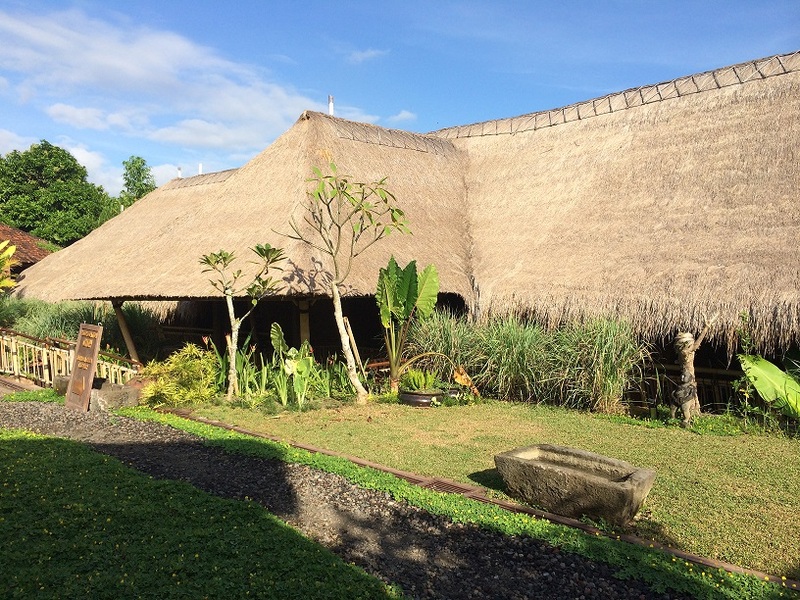 After spending some time researching about the yoga studios in Ubud, I came across the Yoga Barn. Judging from the way the locals reacted the moment I say ‘Yoga Barn’ (everyone I met had nodded enthusiastically to show that they know the place), my guess is that the studio is a popular one. And I was right. When I stepped into the reception, there were already several others inquiring about class schedules and rates. 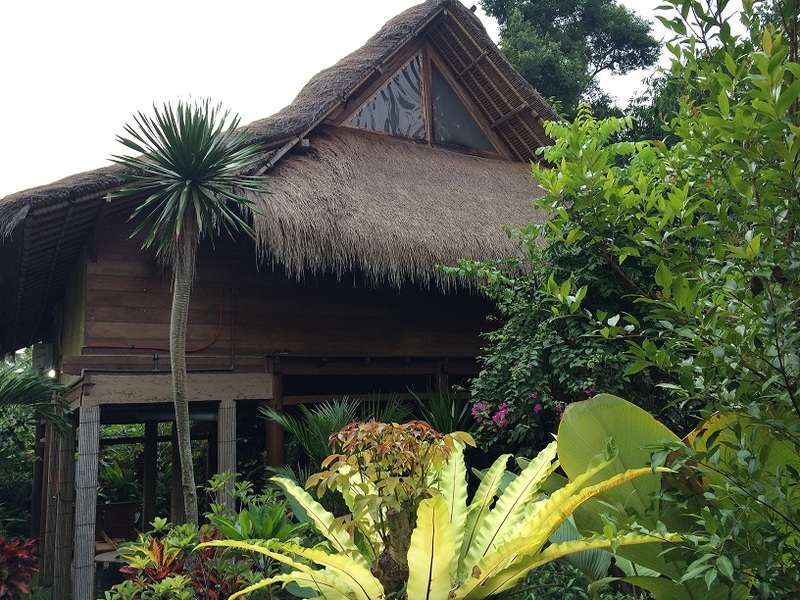 Located at Ubud centre, the Yoga Barn is a place for yoga practice and Aryuvedic treatments. 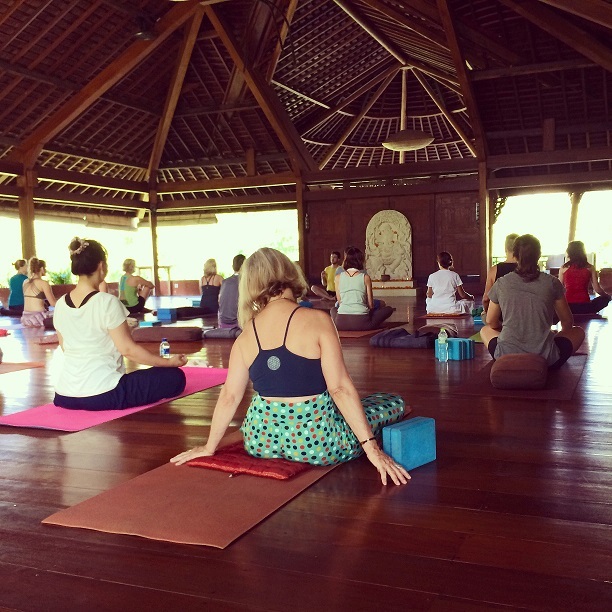 Yoga classes are available throughout the day, starting at as early as 7 am to the last class ending at 8.30 pm. 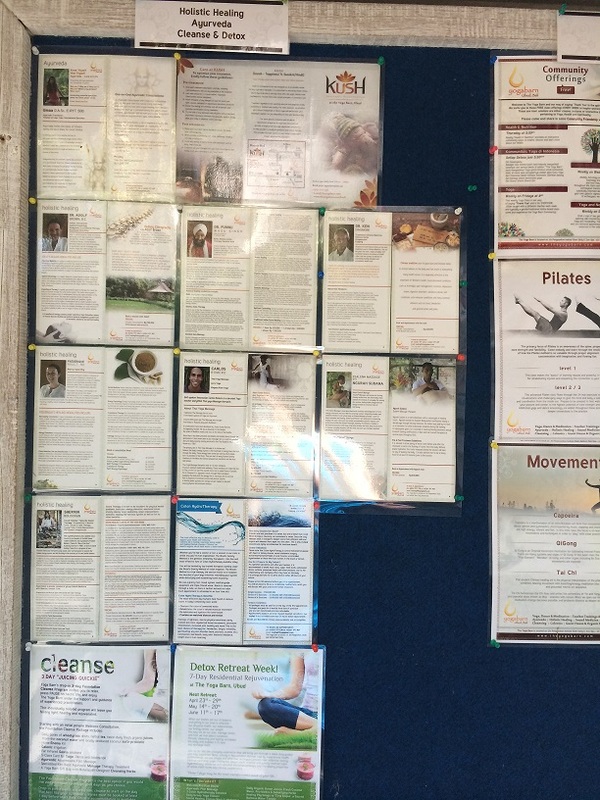 You are free to choose the classes based on your interest and you don’t need to have extensive yoga experience to attend (though it is recommended that you join the level 1 classes if you are new to yoga). The classes are scheduled on a monthly basis, and for those who are keen, you can check out this page here. Each lesson costs about 110,000 rp, but if you intend to attend more than 2 lessons, it might be worthwhile to sign up for packages of 3 or 5. The package is valid for 6 months, as I was told by the reception lady. The back entrance of Yoga Barn. 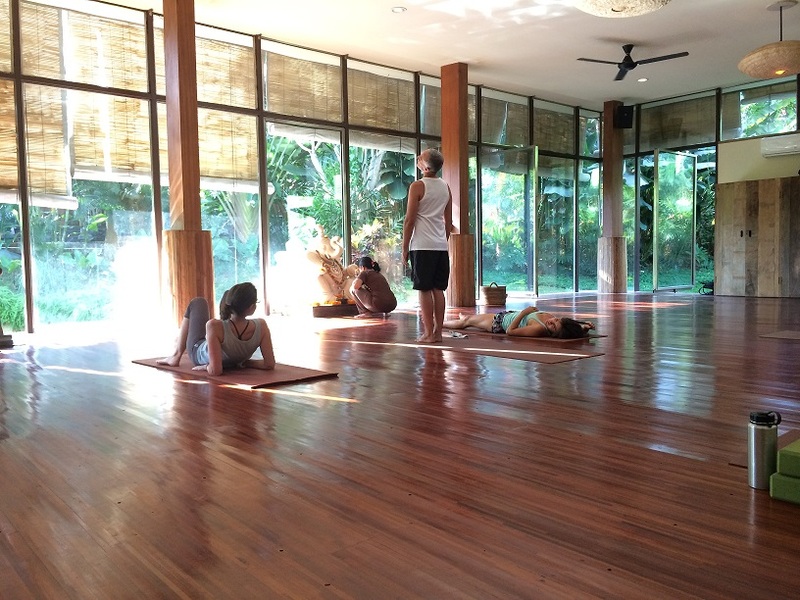 Besides yoga classes, the studio also conduct meditation classes, holistic treatments and wellness seminars. 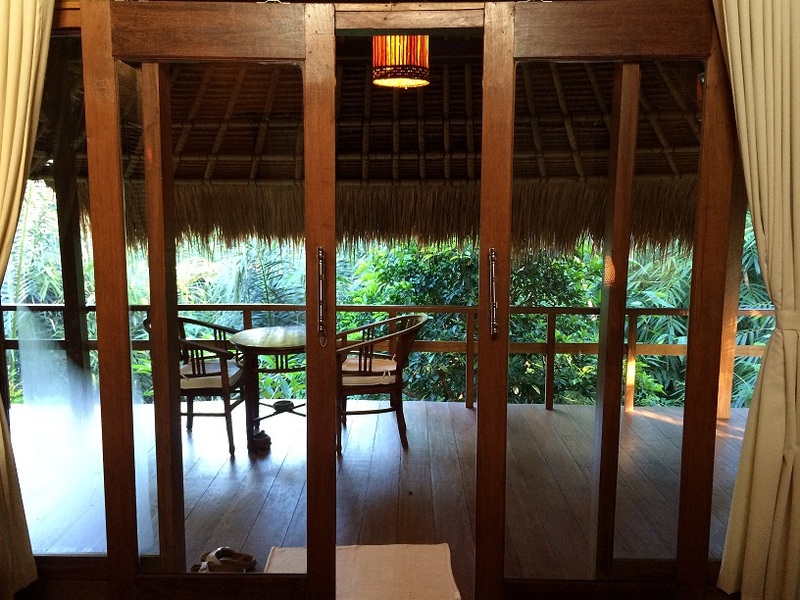 The main yoga studio and reception area. There is also small cafe within its premises. Basking under the morning sun and breathing in cool, crisp air – the best way to start the day. 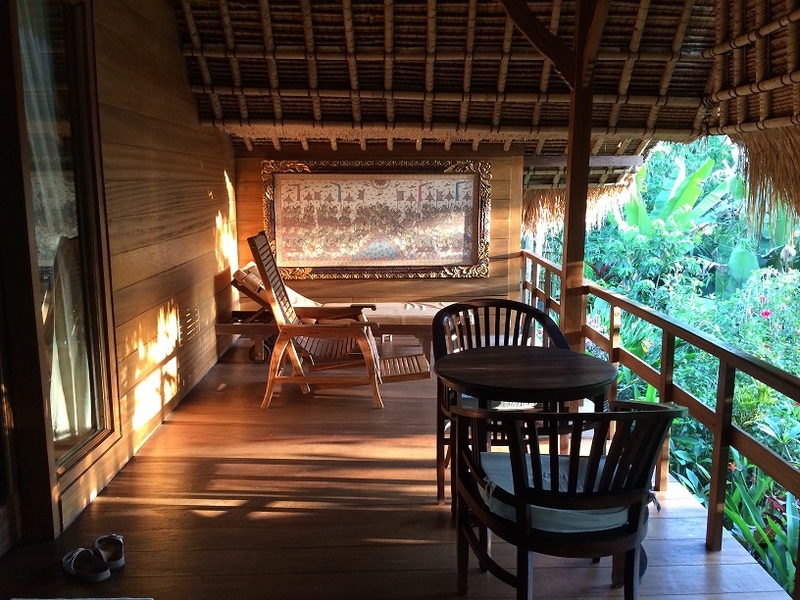 Other than yoga, Ubud is also a place for Balinese massages. Most massage parlors are reasonably priced with pretty decent facilities. On one of the days, I did a two-hour massage+scrub session at a local spa for less than S$40! It was so worth it. 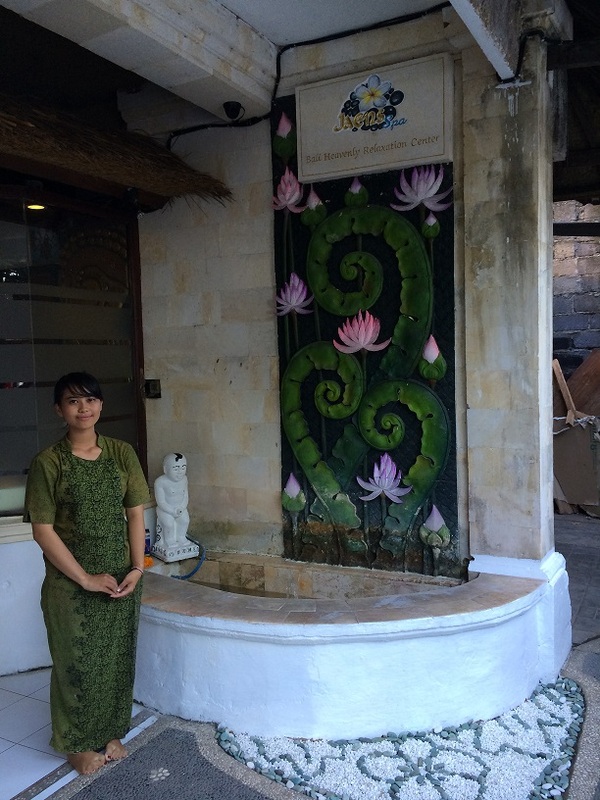 Check out the Jaens Spa if you are in Central Ubud and looking for a nice relaxation session. 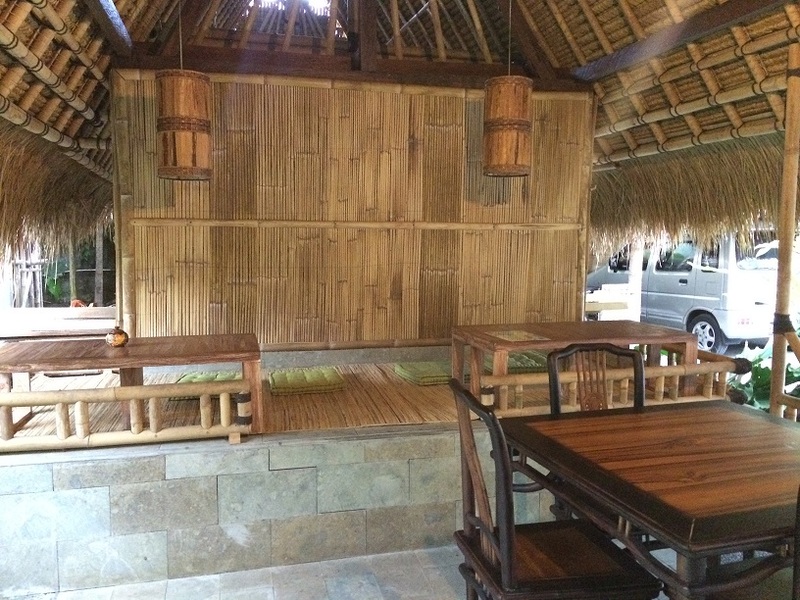 Featured on TripAdvisor, the place is clean and the service is good. Now, who wants to get all sweaty and dirty by walking back to the hotel after a pampering session? If you want to stay fresh and clean (especially if you plan to take a nap right after 😉 , you can arrange for private transportation with the spa to take you back to the hotel. 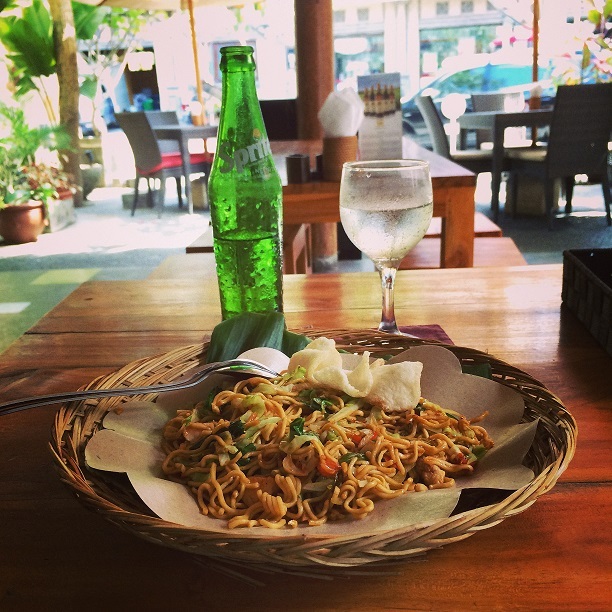 Strongly flavoured with spices and herbs, Balinese cuisine is one that packs a deal. With its alluring aromas and colourful compositions, everyone has got to try at least one of these dishes below to complete your Bali travel experience! 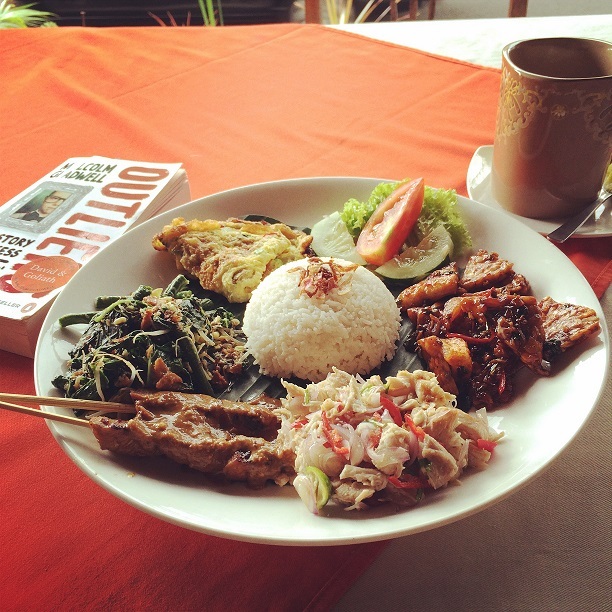 This Nasi Campur in Central Ubud has white rice, chicken satay with peanut sauce, stir-fry spinach, fried egg, tempe and onion chicken salad. A rice dish with various side dishes, Nasi Campur (or also known as Nasi Bali) is a local specialty. Comprising of meat, vegetable, soy and egg dishes, the Nasi Campur is a colourful dish. The Balinese version usually have grilled meat (i.e. satay), fried tofu, cucumber, spinach, tempe, beef cubes, vegetable curry and rice served on/wrapped in a banana leaf (if you are packing). Homestyle Nasi Goreng prepared by my host at the homestay. 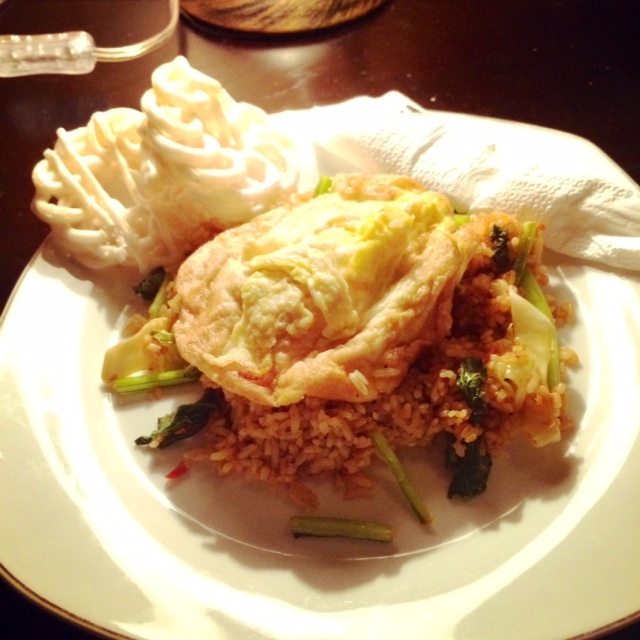 It was one of the best Nasi Goreng I ever had. Referred as the national dish of Indonesia, Nasi Goreng is a simple fried rice dish where pre-cooked rice is stir fried in small amount of cooking oil with sweet soy sauce, shallot, garlic, tamarind and chilli, accompanied by other ingredients such as vegetable, egg, chicken or prawns. They also have this in Singapore, but I definitely like the Balinese version better! Another stir-fried dish, mee goreng is the noodle version of nasi goreng. Cooking methods and ingredients are almost the same, just that the staple used is noodles instead of rice. As I enjoy alternating between rice and noodles, this is also one of my all-time favourites! All gorengs (stir-fried dishes) are typically served with some Indonesia crackers as well. Yummy! Of course, this is not all to the delicious Balinese cuisine. There are many more, but I just didn’t have enough time (or stomach space) to eat them all. I’ve heard that the Babi guling (roasted suckling pig) and Betutu (a heavily seasoned steamed/roasted poultry) are also some unique local specialtoes, so perhaps I will try that next time when I am there! 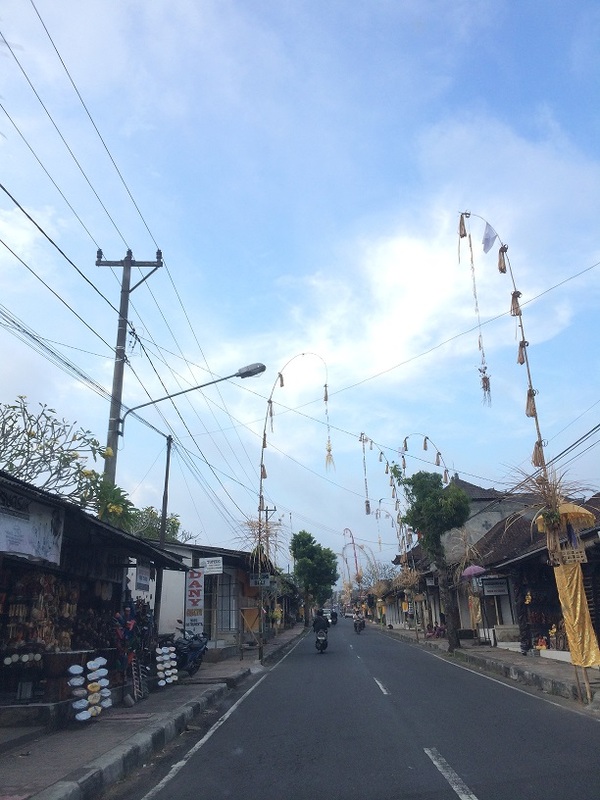 Having explored the cultural side of Bali this time, my next trip to this beautiful island will definitely be to the beach and party scene at Kuta. So stay tuned and watch out for my next entry on Bali!